After enjoying a plate of spaghetti and meatballs in Tony’s Town Square Restaurant on Main Street USA, I photographed the beautiful Lady and the Tramp water fountain found in the dining room with my iPhone. 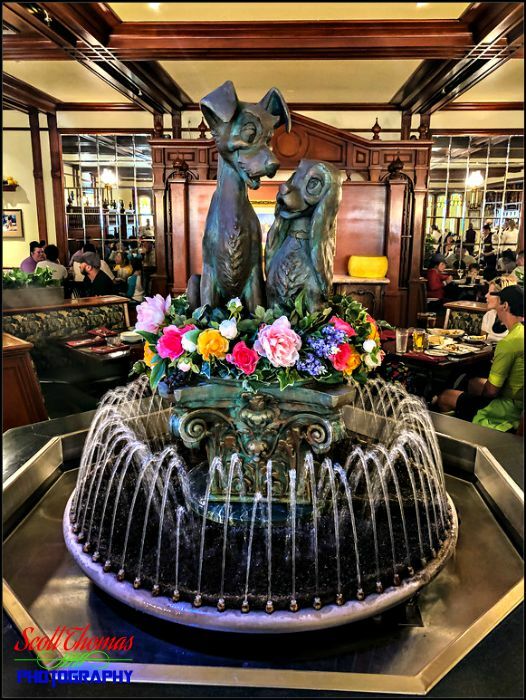 Lady and the Tramp water fountain inside Tony’s Town Square restaurant in the Magic Kingdom at Walt Disney World, Orlando, Florida. Apple iPhone 8 Plus, 1/30s, f/1.8, ISO 500, 4.0 mm (28.0 mm in 35mm) Focal Length. I processed this image in Lightroom Classic on my laptop which is a step I normally do not do with iPhone photos. I will be summing up my thoughts later this month on using an iPhone on this day.